Textile fabric is defined as two dimensional plane-like structure made of textile materials, having reasonable strength, elongation, flexibility, etc., used for different applications, particularly for apparels. Knitting is the second most popular technique of fabric or garment formation by inter-looping one or one set of yarns. Continuous length of yarn is converted into vertically intermeshed loops either by hand or by machine. The term “Knitting” has been evolved from the Saxon word ‘Cnyttan’ which in turn was derived from the ancient Sanskrit word ‘Nahyat’. According to the direction of movement of yarn during loop formation, knitting can be classified as weft knitting and warp knitting. Out of two types of knitting, weft knitting is widely used in India and abroad. The technique of knitting by using two sticks was invented about 3000 years ago and the same was mainly practiced by the women of royal families for making gloves, stockings and caps. 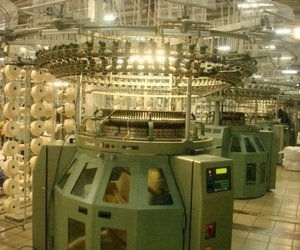 Knitting is one kind of fabric manufacturing process in which fabric is produced by inter looping among loops formed by single or several yarn feeding simultaneously. Knitted fabrics produced with stitch formation. Stitch is most important structural element of knitted fabrics. The stitch consists of a head, two legs, two feet and upper& lower connection point.